After a few months in Asia we were both really craving a good, fresh salad. And along came Laos. Simple. Natural. Fresh. Laap (or laab), was a nightly ritual for us. 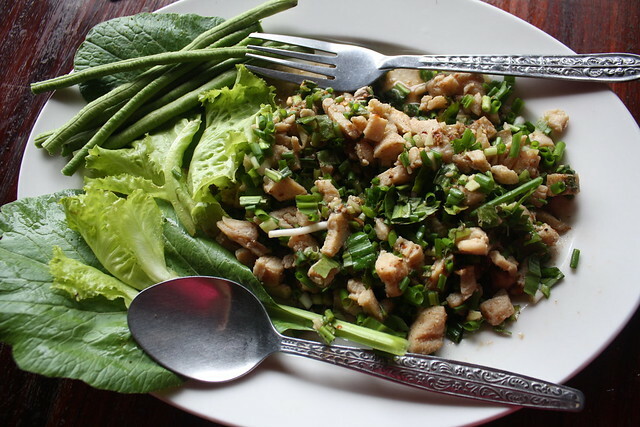 Perhaps the most famous Laotian dish, laap is made from chopped or thinly sliced meat or fish that is mixed with lime juice, fish sauce, mint, coriander, spring onion, chili and uncooked rice grains that have been dry fried and crushed. It is usually accompanied by vegetables including eggplant, fresh chilies, mustard leaves and lettuce. It can be eaten with ordinary rice or sticky rice and is usually eaten with fish/meat soup depending on the main ingredient being used. We enjoyed eating this and all the other Lao food so much we decided to take a cooking course. And I can assure you, it’s as good as it is easy to make. Delicious! Just visited Laos and the food was a great surprise!